This is the same recipe we made for the Super Bowl XLIV Tailgate Party for the Super Bowl in Miami. Now, you can make it, too. After the hummus has been blended, taste and add any more of the ingredients to your taste. Add any of the following and blend again: Cilantro, dill, sautéed onions and garlic, sun-dried tomatoes or olives. Remember, you can make hummus with any kind of beans. Once you know how to make this basic hummus, try making it with black beans or navy beans. 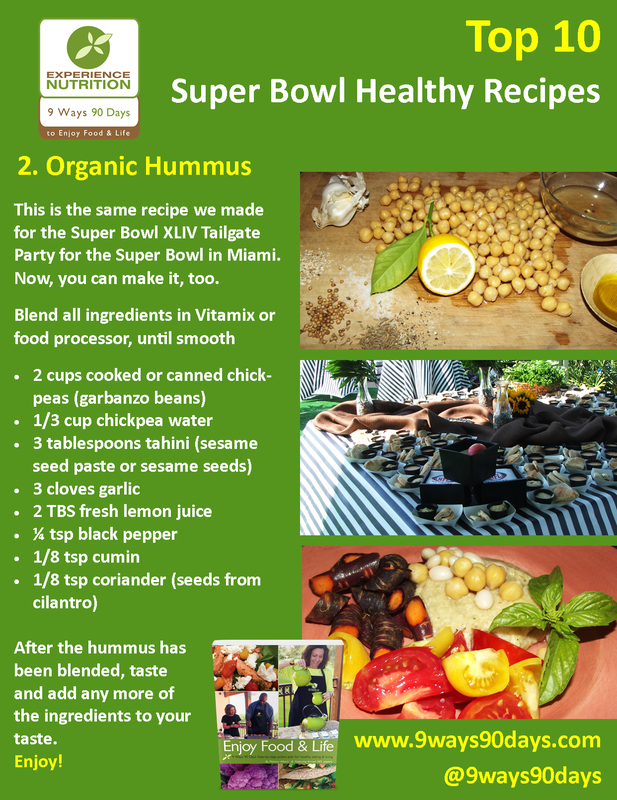 Share your Super Bowl Hummus Photos with us on Facebook: www.facebook.com/9ways90days. Top 10 photos this weekend win free download of new book, “Enjoy Food & Life” featuring nutrition tips and recipes by former NFL players.